As the owner of North Bay POOP 911, I guarantee your complete satisfaction with every job my team completes. Whether it’s an occasional visit or a regular pickup routine, you can count on us to clean every inch of your property. Our goal is to keep all of our clients happy. 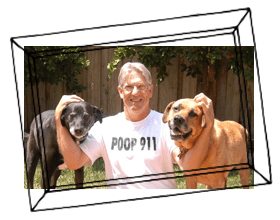 North Bay San Francisco POOP 911 has the answer to all of your poop scooping worries. Parents coming to visit? Kids have a birthday party? Ready to plant those new rose bushes? Call on us to clean and deodorize your yard, patio and dog runs—so you can get back to carefree living. Let’s keep our North Bay San Francisco neighborhoods beautiful! Get a customized quote for services to suit your community’s needs. We can install clean-up stations, restock dog waste bags, poop scoop designated areas, and more. Professional, Courteous , Punctual. Nice to my dog. Very reasonable price. Brian is awesome. Highly recommended! Barbara has been doing an AMAZING job with our backyard!! Thanks Barbara and Pete, who have given us very good customer service! I just want to say how wonderful this service is and how professional and polite Mike is. He’s been coming over every week consistently on mondays and cleans my front yard. It was a wreck before, it’s affordable and I only wish I would have hired you guys sooner. Thanks again! Poop 911 does a great job cleaning my yard! I have had them clean my yard for about 4 years now and I can’t imagine life without them. I highly recommend this service. I just recently signed up and I couldn’t be happier. It’s so nice to be able to depend on this help weekly, especially during the rainy season. They are nice people, quick about getting things picked up, and the charges are reasonable. Give yourself this gift, you won’t regret it for one moment. I haven’t met who comes to my house, but my roommates have. They say she is great. I believe it because my back yard is always clean! They have a lot of options as far as how often you would like service which is great. I started of with once a week and noticed I didn’t really need it. I called and they changed it to every other week no problem! This service is great! Barbra has been exceptional, she has a way with my dogs and does a great job cleaning the yard. This company is fairly priced especially to do a job we dont have the time or desire to do! I recommend! So far, so good. My wife and I are both active duty military so our schedules are all over the place. Most of the time we couldnt find the time to scoop our large back yard, especially in the winter when it gets dark so early. This was a perfect solution for us and it is cheap. Our yard smells and looks so much better.